Tayor Kovar | Author. Speaker. Wealth Advisor. Taylor is the CEO and founder of Kovar Capital Management LLC. 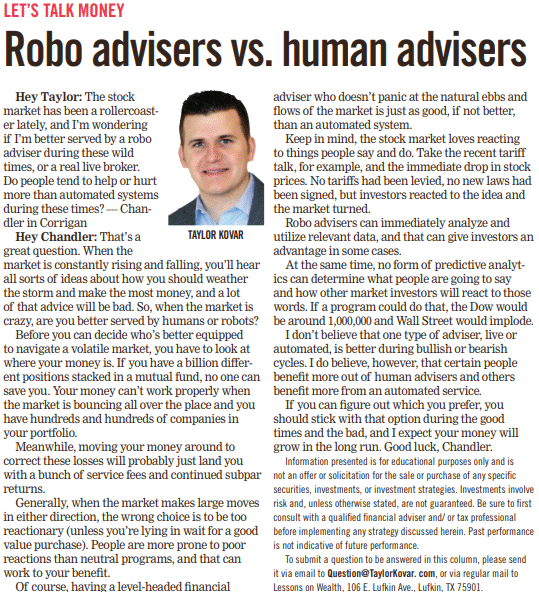 After starting his finance career with a major Wall Street firm, Taylor decided to branch off and start Kovar Capital in order to provide his clients with a more personal wealth management experience. Before founding Kovar Capital, he was a key member of the team that helped launch and implement one of the fastest growing healthcare technologies in the United States, HealthTrust Software. 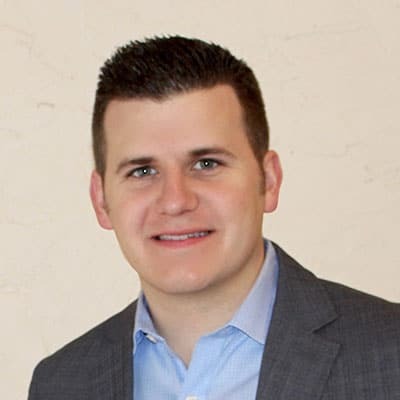 Taylor is also the CEO of Premier Pediatric Therapy, a home-health agency in Texas, and regularly publishes blog posts and helpful resources on his website, Go Far With Kovar. Taylor was raised by good ol’ blue-collar workers, and following in their footsteps led him to take on massive debt at a very young age. It didn’t take him long to realize having debt wasn’t his cup of tea, and he worked his tail off so he could enjoy financial freedom and independence. As an entrepreneur and financial professional, his work has been quoted and published in a variety of different media on topics such as financial management, budgeting, saving, investing, business, healthcare, and more. Now he wants to help others avoid the mistakes he made. His passion is to help everyone live a life that’s as fulfilling as the one he is able to lead today. Taylor is married to his high school sweetheart, Megan, and they live in Lufkin with their three young children. He lives his life and treats others the way that he wants to be treated and it is this lifestyle that has made him a trusted advisor to individuals and businesses across the globe. 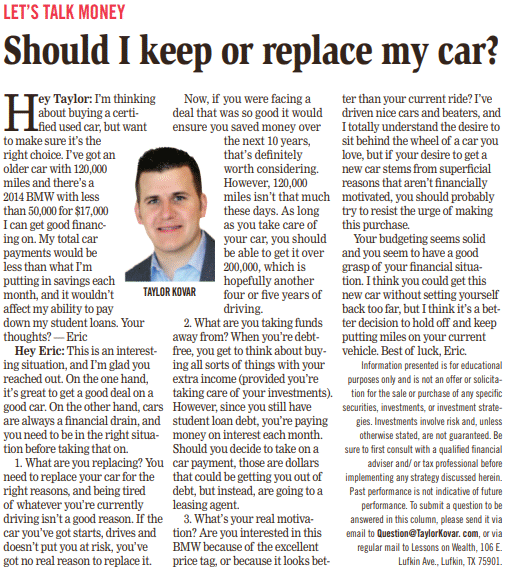 LET’S TALK MONEY: Should I keep or replace my car? LET’S TALK MONEY: Should I refinance my mortgage? 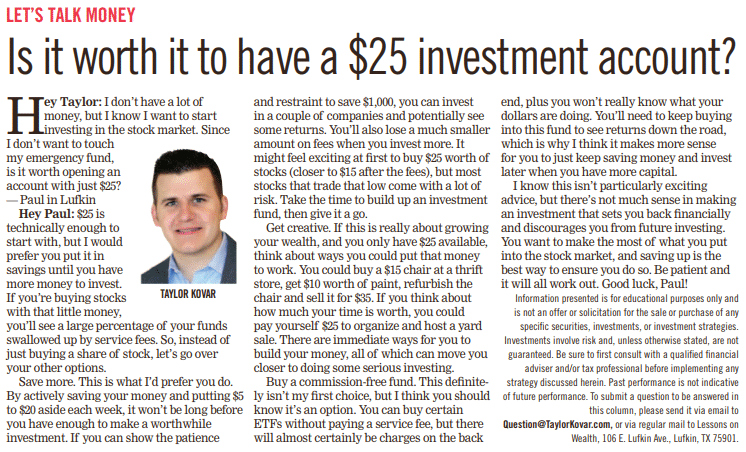 LET’S TALK MONEY: Is it worth it to have a $25 investment account? 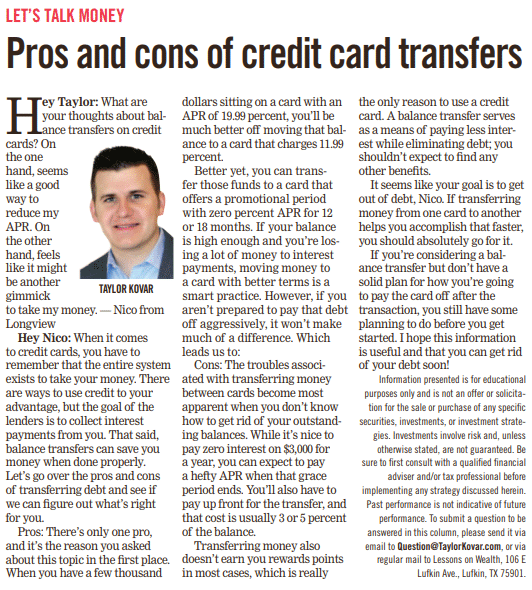 If you are interested in publishing Taylor’s weekly business/finance editorial to your readers or would like additional information, please use the contact box below. You can also email us at Info@KovarCapital.com.and someone from our team will contact you within two business days.